Ghiaroni was an Italian brand of mopeds founded by Efrem Ghiaroni as early as 1966 but was founded only in 1969 after the release of his first moped. 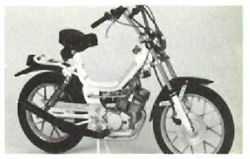 From that moment on the focus was on motorcycles and in 1974 moved Ghiaroni to a new factory in Vignola by Modena. In the seventies there were new models like the Dream, New Deal and Surprise, followed by mopeds for young people like the Bimbo TNT, Bimbo Bip Bip and Klin. In the eighties, these models were updated and had Franco Morini engines.